Kristina is an expert painter. I don’t say that just because of her outstanding work with It’s Only Paint either. I say it because, outside of creating such an impressive and dynamic gallery for the business, she can just flat out work with paint. I cannot. I’m like a toddler when you hand me a paint brush. Despite my best efforts, I drip paint. I smear paint. I flick paint all over the place. I put up tape just to paint over it and hit the ceiling, anyway. I’m an idiot. So, naturally, when we decided to put our house on the market, one of the primary focal points was giving some of our battered walls a fresh coat of cover-up. Our kids had taken every opportunity over the prior two years to scratch and scuff anything within their reach. I’m not totally sure how they did it, but they did. Portions of our stairwell looked like a rest stop curb, black streaks crisscrossing in arbitrary patterns. I almost had to applaud them for their dedication to making the walls look awful. It wasn’t just their fault, though. The previous owners had somebody come in and paint the house to make it look presentable for sale, as well. Instead of using a type of paint that could hold up to abuse beyond a strong gust of wind, they used flat paint that, as we learned, gets marked up with little to no effort. I bumped into a wall wearing jeans one time and left a blue streak the size of a highway marker. Once it is there, there isn’t much you can do about it, either. Wash cloths and paper towels will destroy the wall. Magic Erasers just rub the paint off with the mark. Because of this, a fresh re-painting of the walls was unavoidable and a must. 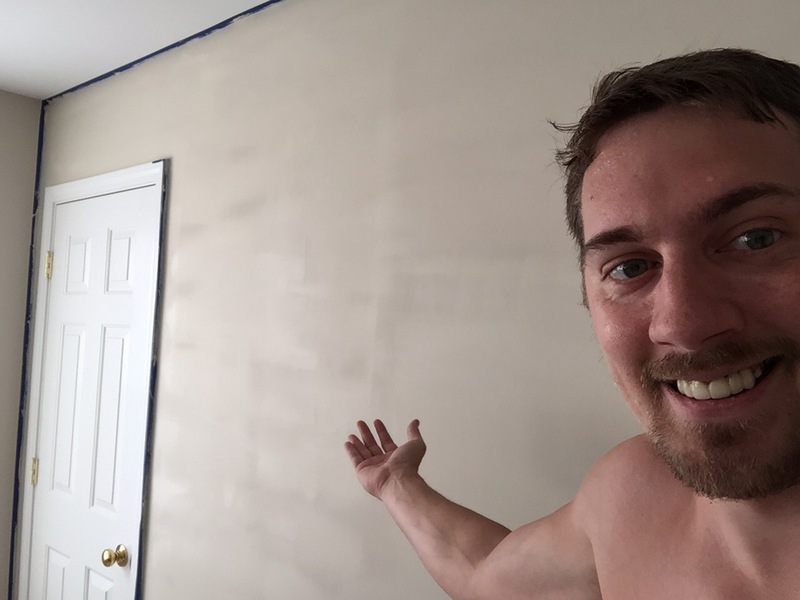 At first I tried to concoct a scheme to remove myself from painting, completely, by doing other things around the house like, I don’t know, pulling out wall anchors and spackling. But that only lasts 30 minutes, at most. It was time for me to paint and I knew it. My wife knew it, too, because she told me. Kristina is quick with a brush. At our first home in Ohio, she painted the entire first and second floors within one week … all while pregnant, mind you. She is amazing. Watching her paint last week was like watching Brian Boitano skate effortlessly at the 1988 Winter Olympics – a dated reference that is meant to both describe Kristina’s skill and also confuse the reader. As for me? It took me three hours to paint one wall. But what a wall it was! Ok, I mostly did a terrible job on it, as well. But between Kristina’s four rooms and my two walls, we got most of the job done. There was one glaring piece left, though. We called a contractor to come and paint our stairwell since it rises some 18 feet high from the landing. Between my hatred of heights and paint, it was a perfect storm of ‘not-gonna-do-it.’ And though Kristina was not pregnant, the idea of free-falling from a ladder down the steps was still unappealing to her. Apparently when the shenanigans from “Home Alone” happen in real life, it isn’t nearly as comical. With a fresh coat of paint and good cleaning, our house was ready to be shown … but that is an ongoing story meant for another day.